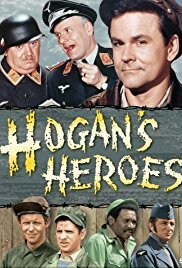 Though the satire of The Producers can’t be matched for the way it brilliantly and satirically pokes hilarity at worst calamity in human history, the 60’s television series Hogan’s Heroes, while not quite as outlandish, is still an enterprise that has made some uneasy and others downright angry at the subject employed for a situation comedy. The show sets the grimmest of experiences into a hotbed of belly laughs, while still cognizant of the mortality of war. The fact that this risky proposition managed to run for a remarkable 168 episodes was a testament to its stars, and humor to makes fun of stupidity and incompetence. Stalag Luft 13 is a markedly successful Nazi Germany prisoner of war camp owning the bragging rights of no allied prisoner escaping beyond its barbed wire perimeter. Within the shows character dynamic this success would seem to be attributed to the camp’s leadership, anchored by Camp Commandant Colonel Klink (Warner Klemperer) and Sgt. Schulz (John Banner). But the truth is that anyone can basically come and go as they please.